I've been asked dozens of times in the last year to create a new form to help landlords ask the right questions on the telephone to help determine if the caller is someone you'd like to set an appointment to show your rental to. The LPA's new Tenant-Finder™ Pre-Screening Telephone Worksheet has developed from a simple prospect card into a handy and more complete screening tool for telephone interviews. Have you ever met prospective tenants at your rental property, shown it to them, had them fill out a rental application only to find that they were nowhere near qualified? A simple pre-screening telephone interview can be a major time saver. Why not focus your attention on the most qualified prospects? Before giving out the address of your rental property and committing your time to a doomed appointment with an unqualified renter, you have a chance to more carefully evaluate which prospects are worth meeting with. I feel very strongly about strict tenant screening, which begins at First Contact with the tenant. First Contact is when you speak with the potential tenant for the first time, usually when they respond to one of your rental ads. At that point, you have the opportunity to learn what you can about this person's current situation. Are they employed? Can they afford your rental? Do their moving dates correspond with your rental's availability? Is their credit rating acceptable? And so on. 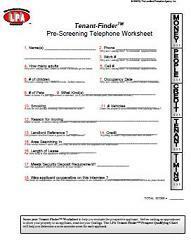 After completing your Tenant-Finder™ Pre-Screening Telephone Worksheet, you can use the scoring area to evaluate your new prospect. Print up a pile of them to screen your next tenant! Eliminate bad tenant risks before spending your valuable time on them.